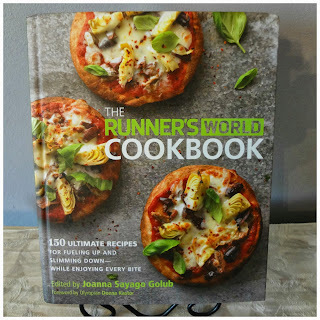 Earlier this month I was sent the new Runner's World Cookbook to review! Having taught several Food and Nutrition classes, this was right down my alley and I couldn't wait to take a look at this book! I admit, I am one that DOES judge a book by it's cover, and this one did not disappoint. I love that this is a very sturdy hardcover book. Even with modern conveniences and the ever so popular Pinterest, I still use cookbooks, and I use them hard! So I was happy to see that this one will be able to withstand my use! Another thing I will admit about cookbooks is that if it doesn't have a picture of the final product, then I probably won't attempt to make that recipe. I like pictures! This book had a good balance of content and pictures. I love how colorful it is! This book is actually more than a cookbook. 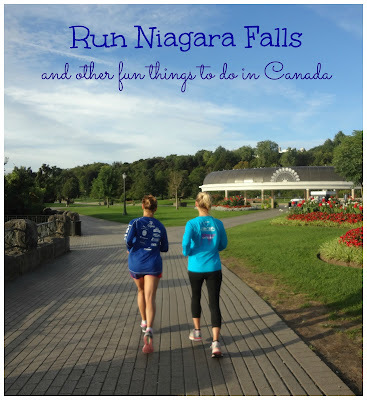 It's a resource for runner's and anyone who wants to adapt to a healthy eating style. It is prefaced by what it means to eat like a runners and how to eat like a runner. There is a guide on how to buy bread and pasta, using the right oils, and how to pick the best seafood. If you like pancakes, you'll love the section on pancake batter and topping ideas! There are over 50 unique pancake flavors including Hawaiian, Pancake S'more, Cafe' Hotcakes, and Caramel Apple just to name a few! This cookbook is very easy to use too. At the top of every recipe is a color coded tab. This tab will tell you if the recipe is for Pre-run or Recovery. Other tabs will tell you if it is gluten free, low calorie, vegan, or vegetarian. There are also recipes that are labeled as fast, which can be prepared in 30 minutes or less. There are so many fun features about this cookbook that I could write about it for a long time, but instead I will save it for a future post. 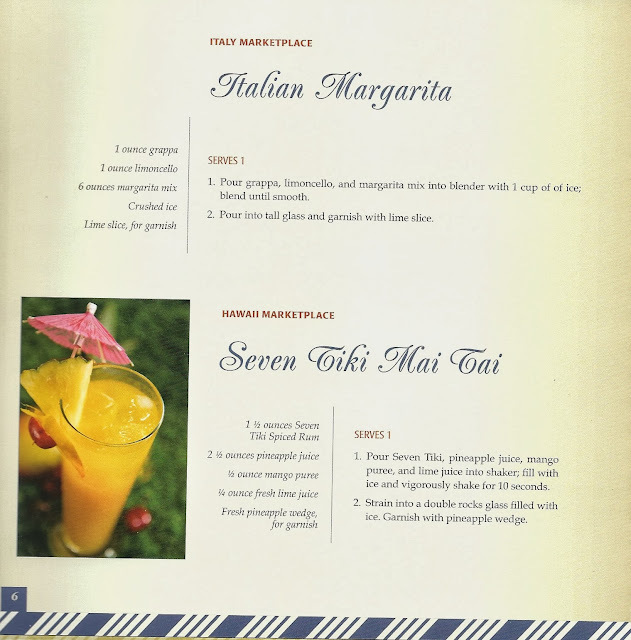 For now, I will share some of the recipes I have made. 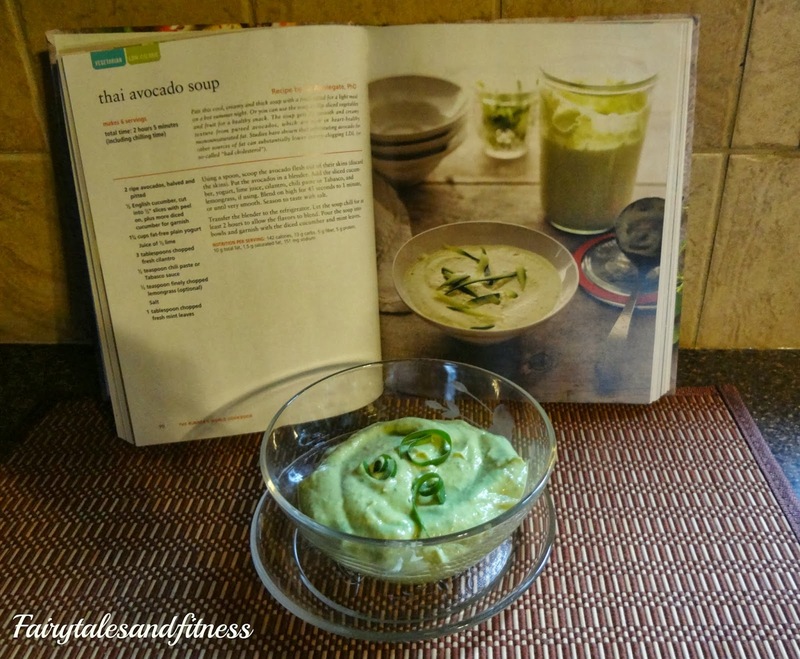 2 ripe avocados, 1/2 English Cucumber, 1 3/4 cup fat free plain yogurt, juice of 1/2 a lime, 3 tablespoons of cilantro, 1/2 teaspoon of chili paste or Tabasco sauce, 1/2 teaspoon of lemongrass ( optional). Blend all ingredients in blender and then let chill for 2 hours before serving. 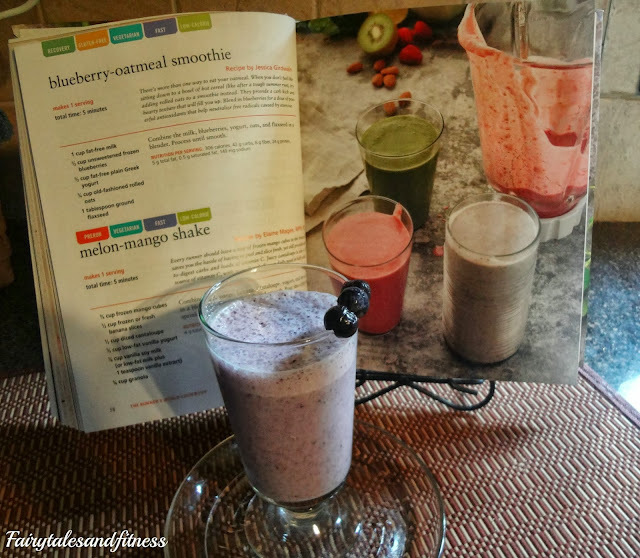 1 cup of fat free milk, 1/2 cup unsweetened frozen blueberries, 1/2 cup fat free plain Greek yogurt, 1/4 cup old fashioned rolled oats, 1 tablespoon ground flaxseed. Blend in blender until smooth. The Runner's World Cookbook will be released on October 1! It is available in a hardback version and Kindle version. For more information on the recipes in this book or to try the cookbook free for 21 days click Here. 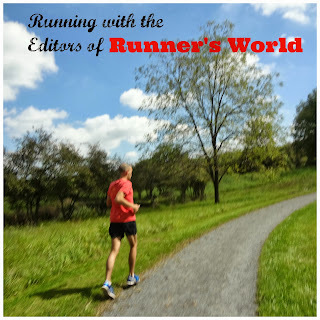 *I was given a complimentary Runner's World Cookbook in exchange for my written review of the product. Friday of course was a rest day for the both of us after completing that much mileage ( although I did a lot of walking to keep my sore legs from getting too tight). Saturday has been an extremely fun day so far. I got to attend a race ( not as a runner but as a writer) at our local high school. The high school band and choir put on a 5k and 10k race as a fund raiser. They are rainsing money to off set their trip to guess where???? Disney World! So of course I accepted the challenge to write about this. 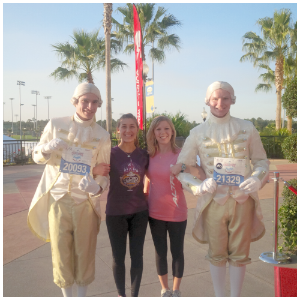 Disney AND Running, there couldn't have been a better assignment for me! 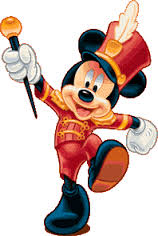 The students will be marching down Main Street of the Magic Kingdom on December 4th for the 10am parade! The Choir will be singing in the candlelight processional in Epcot the night before. I'm so excited for these students. For some, it will be their first time experiencing Disney! After the 5K and 10K at the school, I was off to our local church to report on yet another race. This time is was a 5k to raise money to stop human trafficing. It was so great to see so many locals out supporting a good cause and running on such a beautiful fall day! Has your local school district ever sent students to Disney? 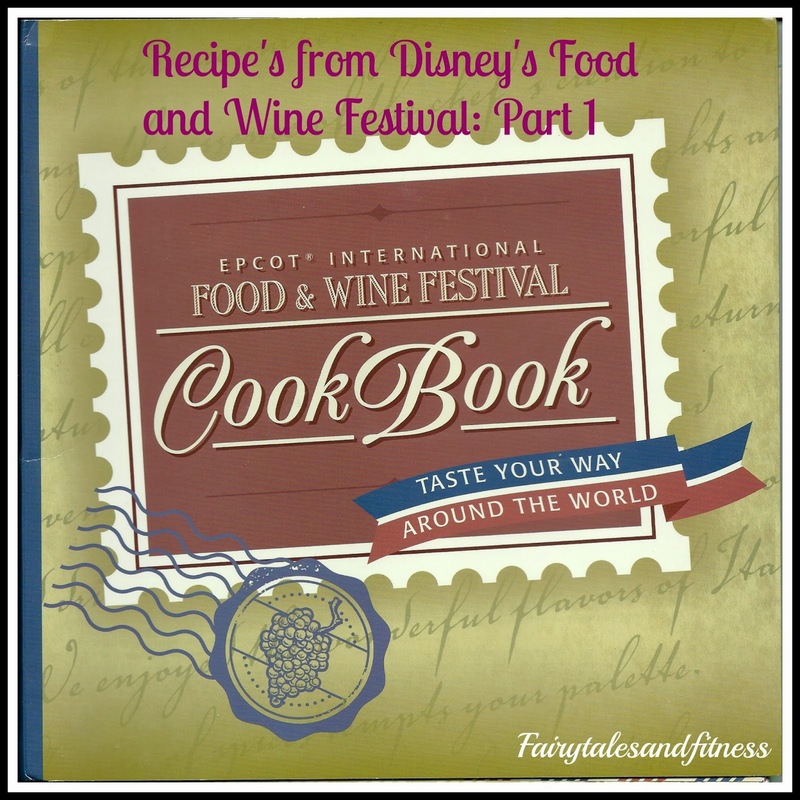 Today is the start of Disney's International Food and Wine Festival at Epcot, and to celebrate we are featuring one of our favorite Disney cookbooks. 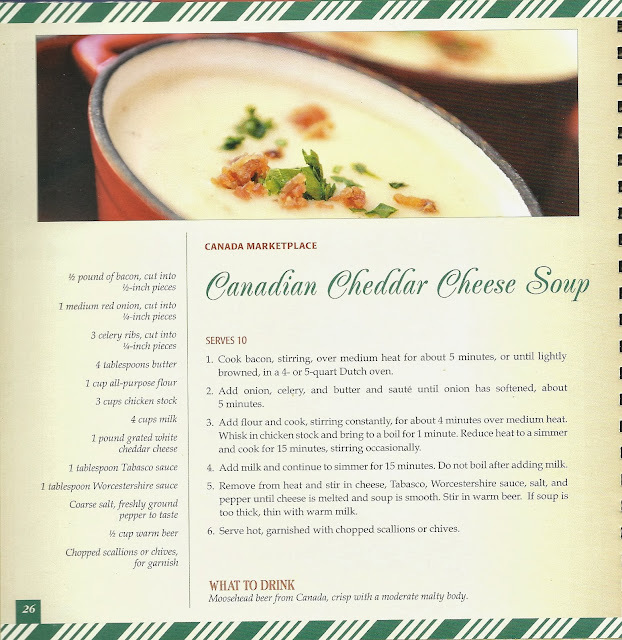 At this point, neither of us has eaten at the Canadian Pavilion but we've heard fabulous reviews of the cheddar cheese soup there. We were in luck when we saw that this cookbook featured it. We actually made this yummy soup and are sharing the recipe with you here. I suppose you would need a drink to wash it down with, so how about trying one of these yummies! 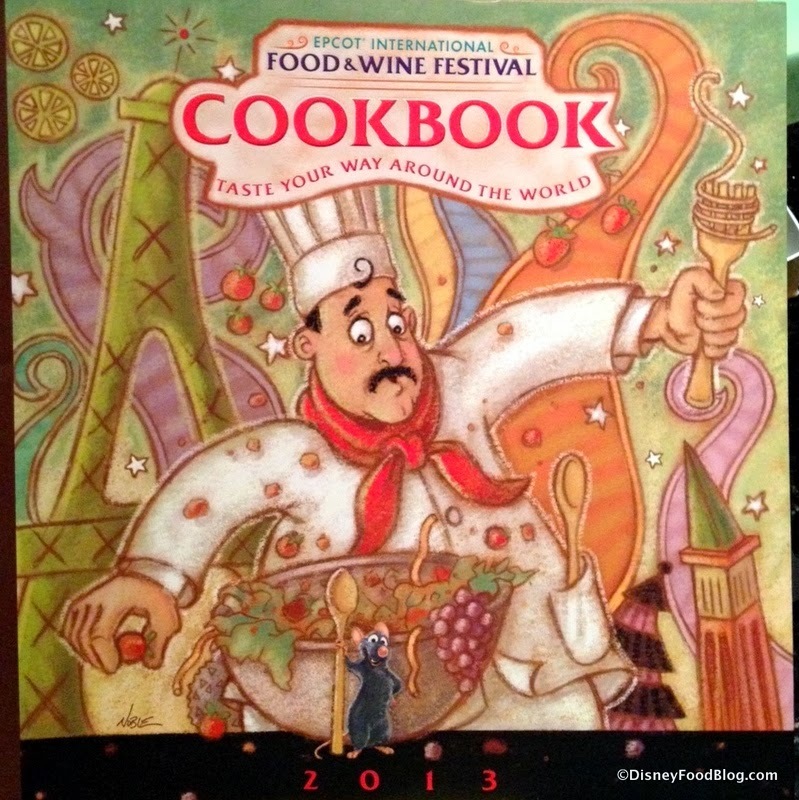 Has anyone got to view the new Food and Wine Festival Cookbook for 2013 yet? 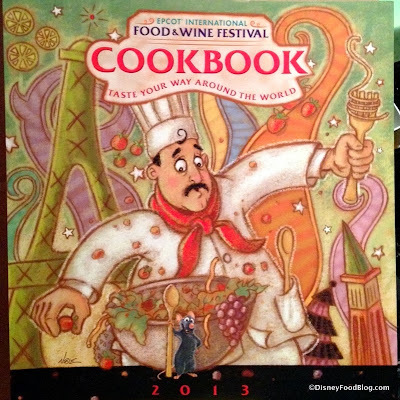 The International Food and Wine Festival runs from today until Nov 11. 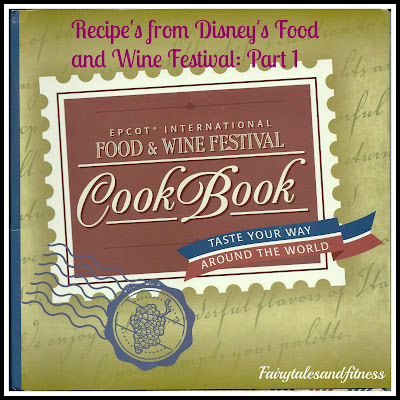 If you've been there before, what is your favorite part about the F &W Festival? 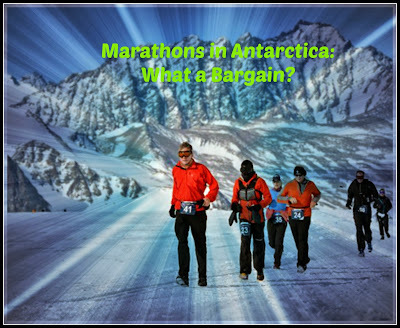 Antarctica Marathons: Do you think it's a baragin? 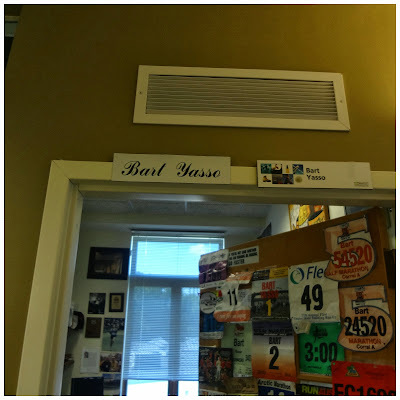 I have been thinking about all those cool race bibs that adorn Bart Yasso's office door and the one that stood out to me the most was the one from Antarctica. I decided that I wanted to know a little bit about races in this region. I have found that this is the ultimate ( or most extreme) in Race-cations. Runner's that register for the Antarctica Marathon are usually those who's goal is to complete a race on each continent. Is this you? I've found the Antarctica Ice Marathon is scheduled for Nov 2013 and the Antarctica Marathon is scheduled for March 9, 2014. The Southern most marathon in the United States might be in Key West, but the Antarctica Ice Marathon is the Southern most race in the world. I was intrigued when I saw you could enter this marathon for the bargain price of only 10,500 Euros. 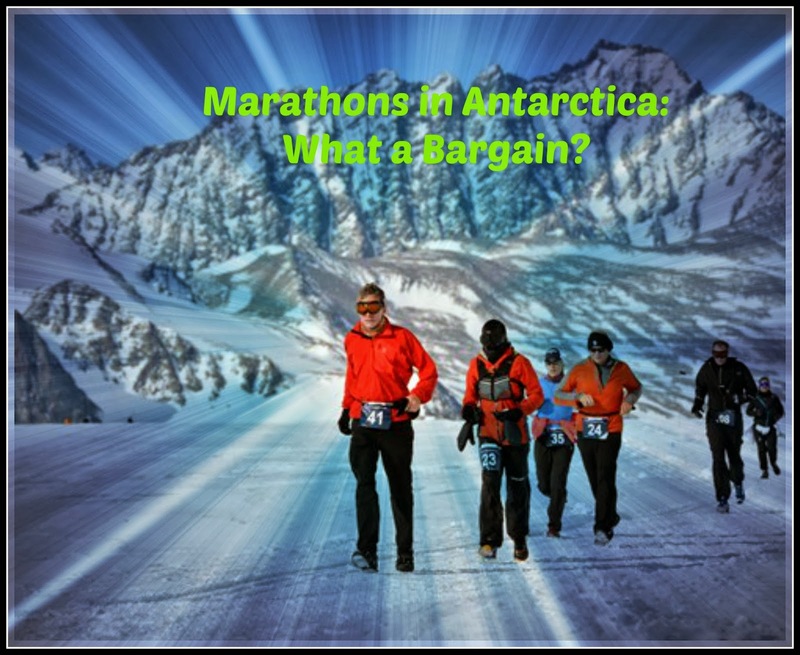 The Antarctica Marathon website claims that this is an incredible value! For this price the runner will receive round trip airfare from Punta Areas Chile to the glacier camp ( but how you get yourself to Chile is your own responsibility), accommodations and food for 5 days, race entry, photos, commemorative certificate, medal, patches, and of course the t-shirt. Both the Antarctica Ice Marathon and Antarctica Marathon give participants the opportunity to do excursions such as mountain climbing, and zodiac and wild life excursions. Expect the temperature to range between 15f-34f ( although the wind chill could lower that temperature another 10 degrees, brrr!) The good news is that you don't need any special shoes for this race. The course is entirely on dirt roads and runners are encouraged to bring two pairs of running shoes ( because it is a possibility that your shoes will get wet ( and who wants to run in wet shoes?). okay, so who is now putting a race on every continent on their bucket list? 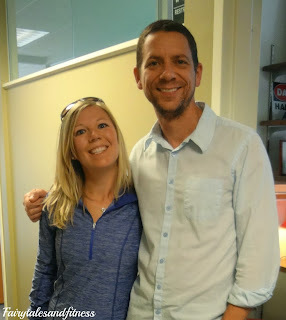 If you haven't read the first part of our visit at the Runner's World Headquarters you can read that here. 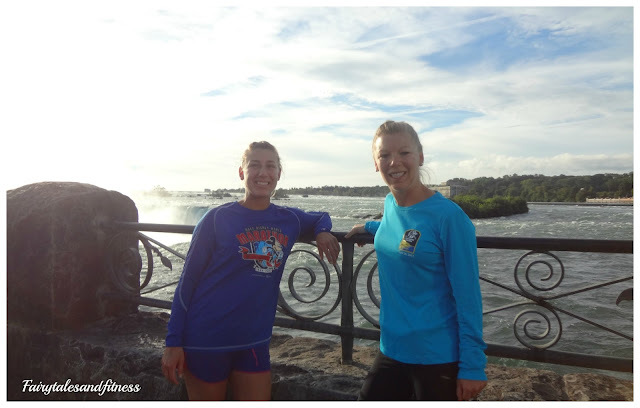 The second part of our Runner's World trip consisted of going to the race location. I didn't realize that the location of the race was not near the Runner's World Headquarters. We had to drive about 20 minutes away. This brought us to the historic Bethlehem Steel Stacks. 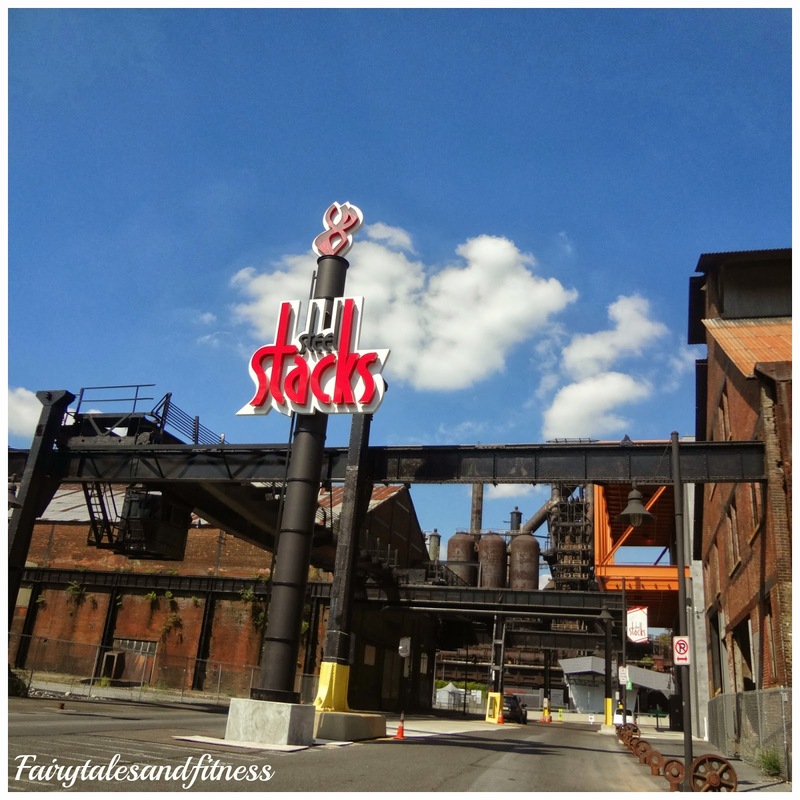 The steel stacks are the backdrop for finish of the Runner's World 5K, 10K, and Half Marathon. The steel stacks are no longer used, but Bethlehem has done a great job with revitalizing the area. There is a very nice complex built around the steel stacks. 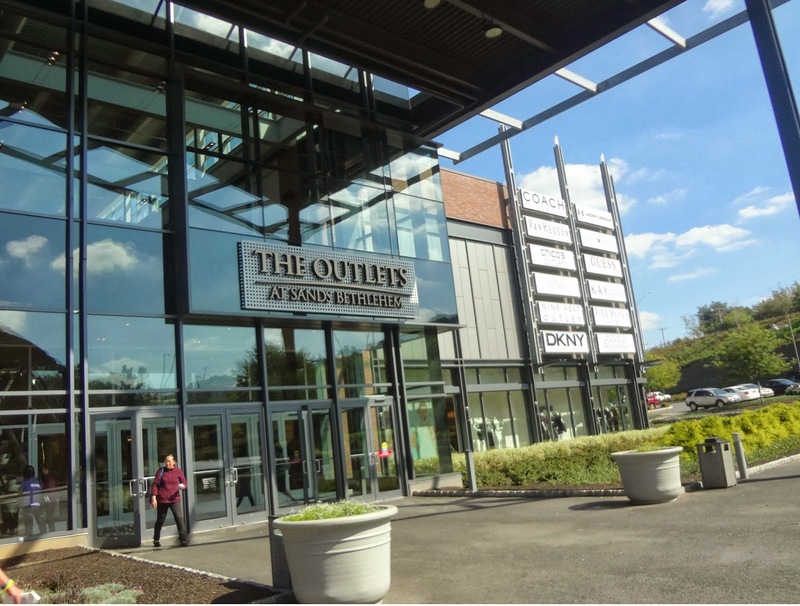 It consists of an ArtsQuest Center ( which is an art gallery and entertainment venue), the Sands Resort and Casino, and the Sands Shopping Outlet. It just so happened that the place that films Sesame Street was also located in this complex so we had to stop in and check it out. 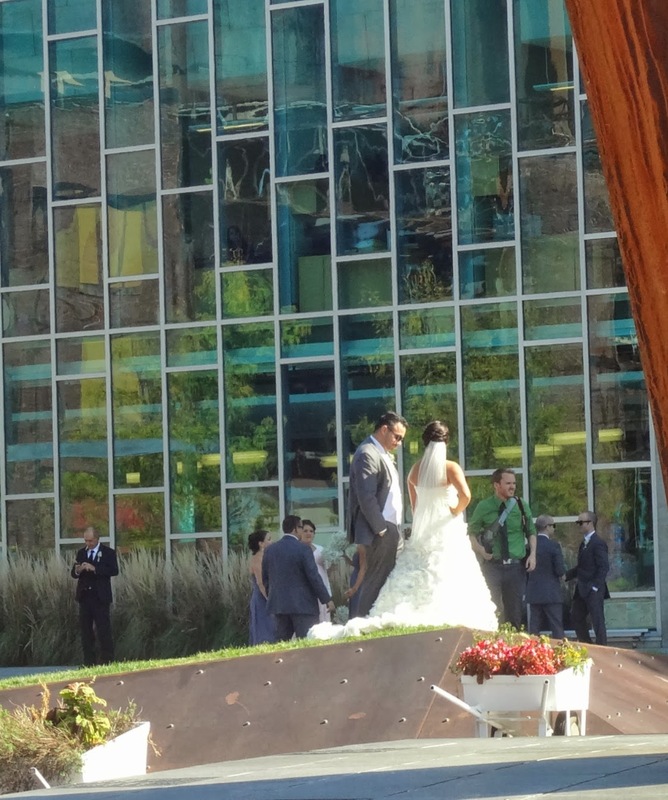 When we were walking our way back to the parking lot, we started to hear some music and then I looked off towards one of the buildings and saw a bridal party all getting their pictures taken. 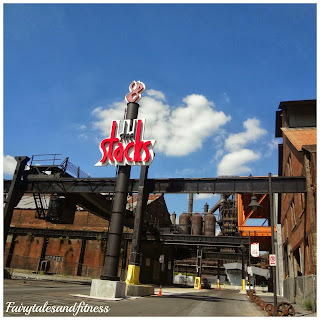 The bride and groom were using the old steel stacks as a backdrop to their wedding photos. The steel stacks are a great historic site, but not something I pictured being in wedding photos, but hey, to each his own. 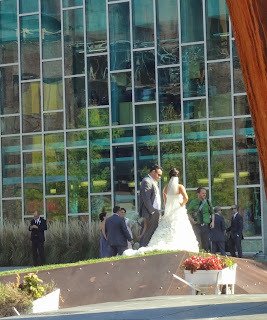 We later found out that it is quite common in this area to get wedding photo's done in front of the stacks. I thought the music that we heard was for the bridal party, but it turns out that it was coming from the stage. They were setting up for Friday night's concert. This is also the location of the annual Bethlehem Music Fest! I believe this area is where some of the post race activities will be taking place for the Runner's World Festival. Although not as exciting as visiting the Runner's World building, it was pretty cool learning about a place I didn't even know existed. Have you ever visited a place you knew nothing about? 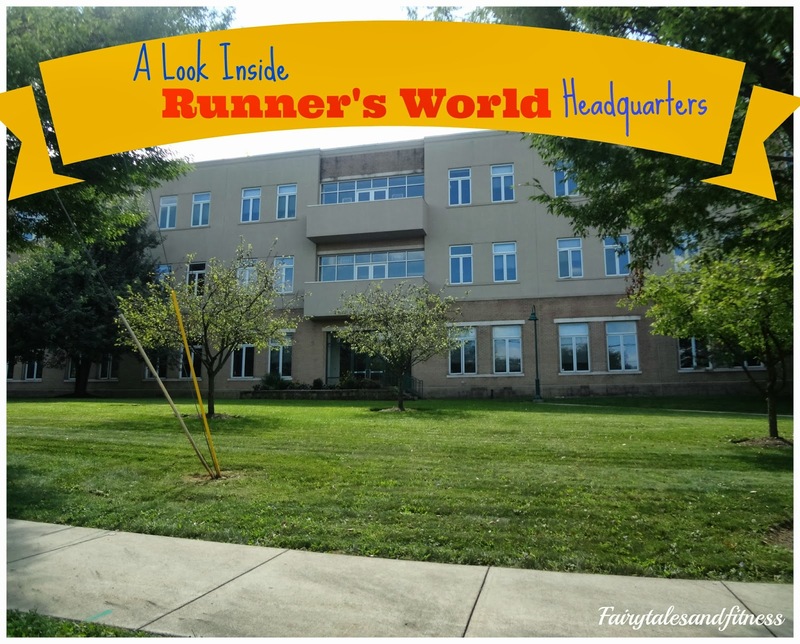 Last Friday we had the opportunity to tour the Runner's World headquarters in Emmaus, PA. As soon as we walked in the building we were in AAAW! 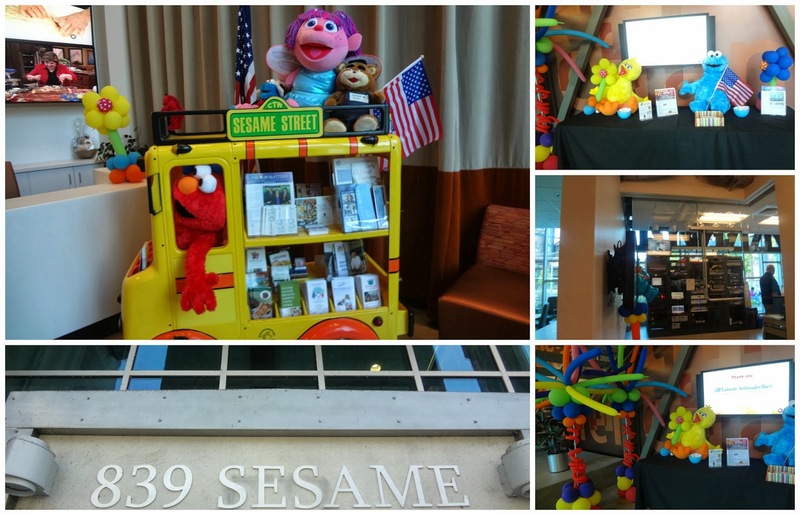 The inside of the building is so bright and inviting and the staff was so friendly. 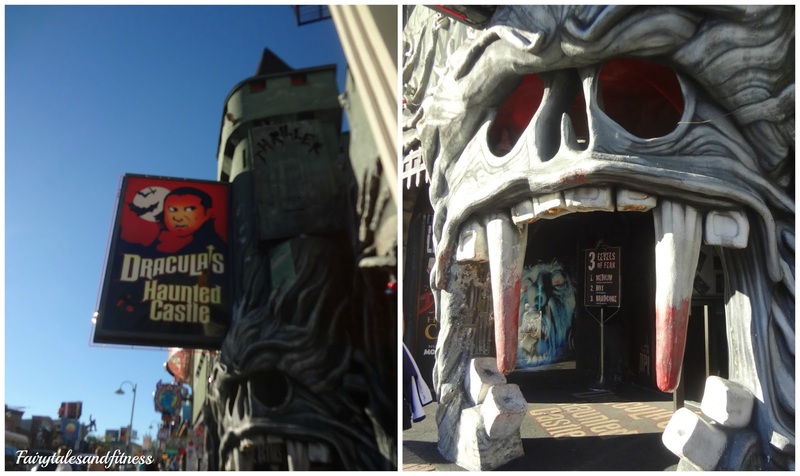 In order to keep this post a reasonable length, I'm going to just touch on some fun/interesting facts from the visit! 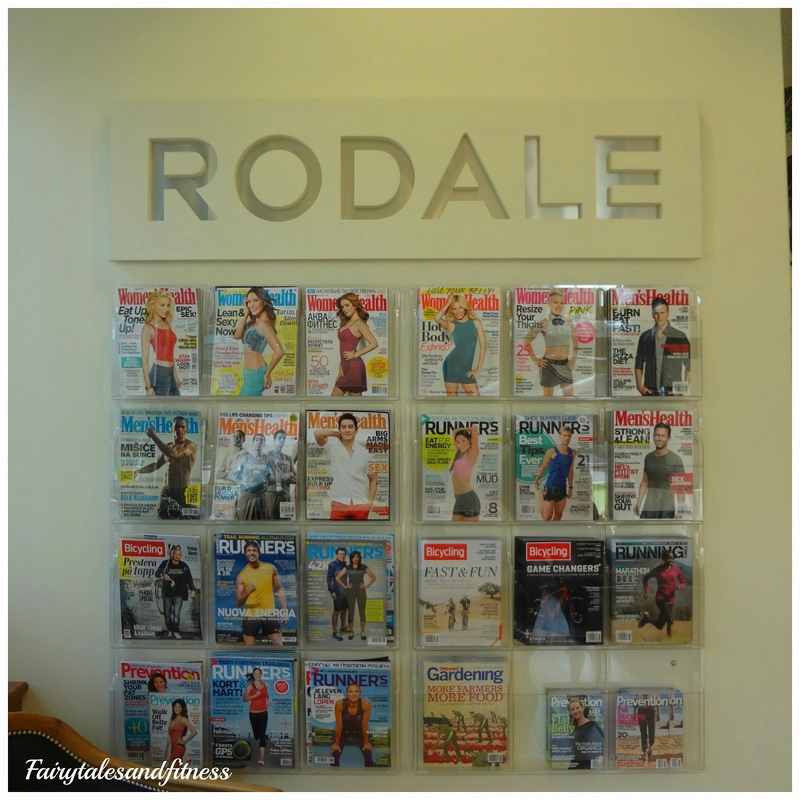 Rodale Press is the publisher of Runner's World Magazine. 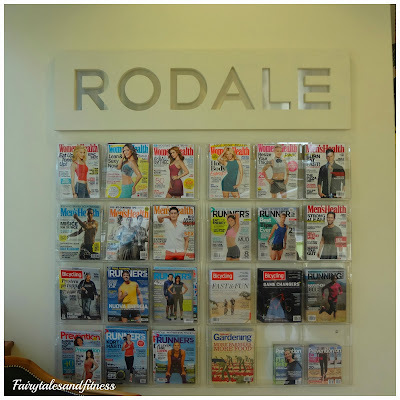 Rodale also publishes other "healthy living" magazines such as Woman's Health, Men's Health, Prevention, Running Times, Bicycling, Organic Gardening, and various hardbound books on similar topics. I was in Aaaw just seeing all the new books and magazines displayed in the lobby! 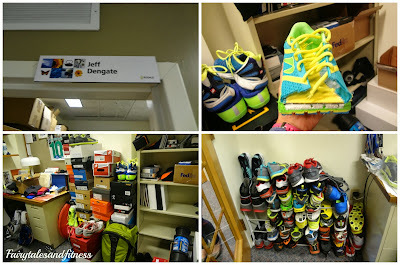 Since we were there to visit Runner's World, we were taken to their floor in the building. One of our stops was ( as you saw earlier) Bart Yasso's office! And a peek of the inside. Next we were taken to the wall of International Runner's World Issues. It is interesting how the content remains the same for the international issues, but many of the pictures are different. Some pictures need to be changed because the clothes that we see the runner's wearing in our issues of Runner's World may not be appropriate for another country's culture. Also the international issues tend to include models from their own culture. 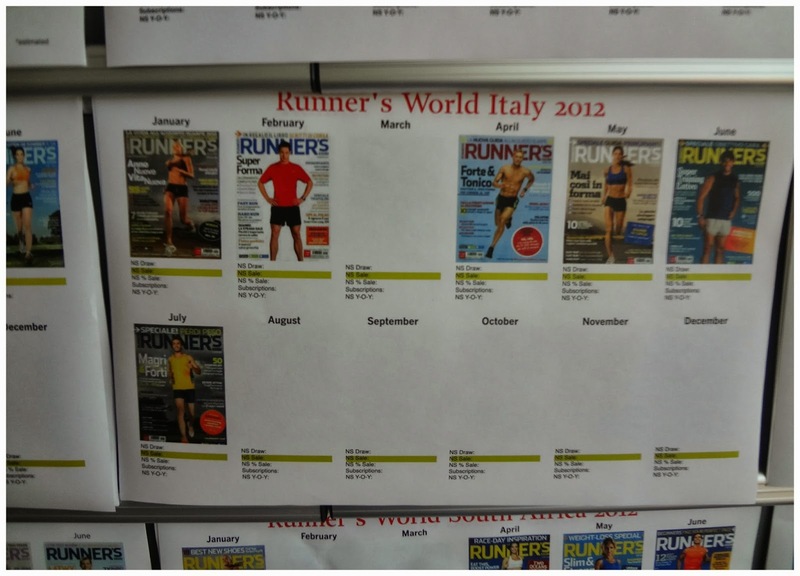 Yes, Runner's World does use models for their photos. We were told they are Fitness models and they DO run! 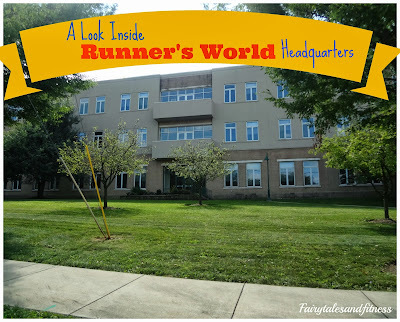 The Runner's World photo studio is located down the street from the headquarters. Also there is another building in NYC which also shoots cover photos. 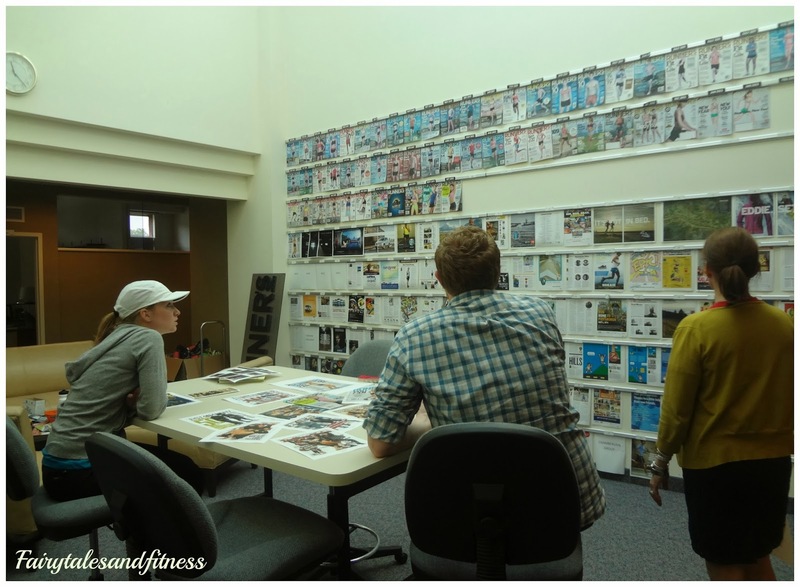 Our wonderful hostess and Runner's World writer, Megan shows me how content is selected for the magazine, which articles she has worked on, and how the photos were shot. My first bachelor's degree is in journalism and I love to write, so I am totally interested in what she is telling me! You may remember Megan from the article she wrote about her experience at the Boston Marathon this year. I remembered reading the online version of her story just days after the marathon. I was so happy to have met her! Next, we were introduced to Mark Remy from Remy's World. We were invited to do a run with him and the other editors later in the day! Here is a sneak peek of the next issue of Runner's World that is going to be published. It's all laid out page by page. 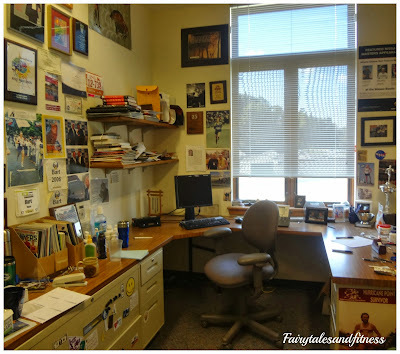 Seeing this reminded me of working on our high school yearbook many years ago! How would you like this job? This is the office of the gear tester. He definitely takes his job seriously. When he reviews a pair of shoes and says that he cut them apart, he literally cut them apart! Amongst all the fun and touring, we did get to talk about the upcoming Runner's World Festival and it got us very excited. I'm looking forward to all the interesting seminars on running, and there will even be one on running with your dog! I was told that there will be a special guest here running among us in October. Do you want to know who? It's Summer Sanders. Lacey got to meet Summer when she ran the Boston Marathon this year. Soon it was time for us to go prepare for our run. It was run at work day and we were going to run with some of the editors. Who are we kidding, It's Runner's World, EVERYDAY is run at work day here! We made our way down to the woman's locker room and changed into our running clothes. Need a bike to test out? 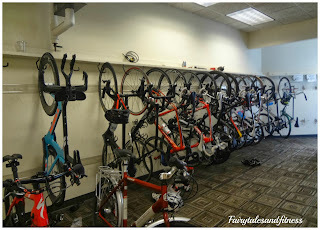 Next to the locker rooms is the bike room. There is a great jogging path a little ways past the Rodale building that we ran on. I didn't want to be a total geek and take pictures of our run, but I did manage to get this one of one of the editors who was leading the pack! It was a great run, but I'm pretty sure that they took it easy on us! I couldn't tell you what our pace was because right before the run my Garmin decided to freeze up! Since this post is getting a little lengthy, I will stop here. I will continue with part 2 in another post. 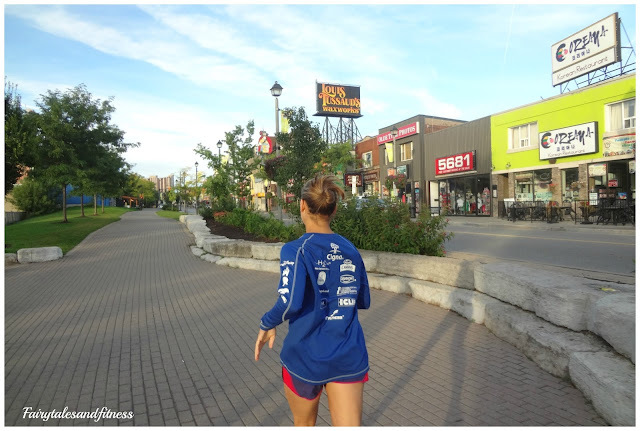 Click HERE to read part 2 of our Runner's World visit. 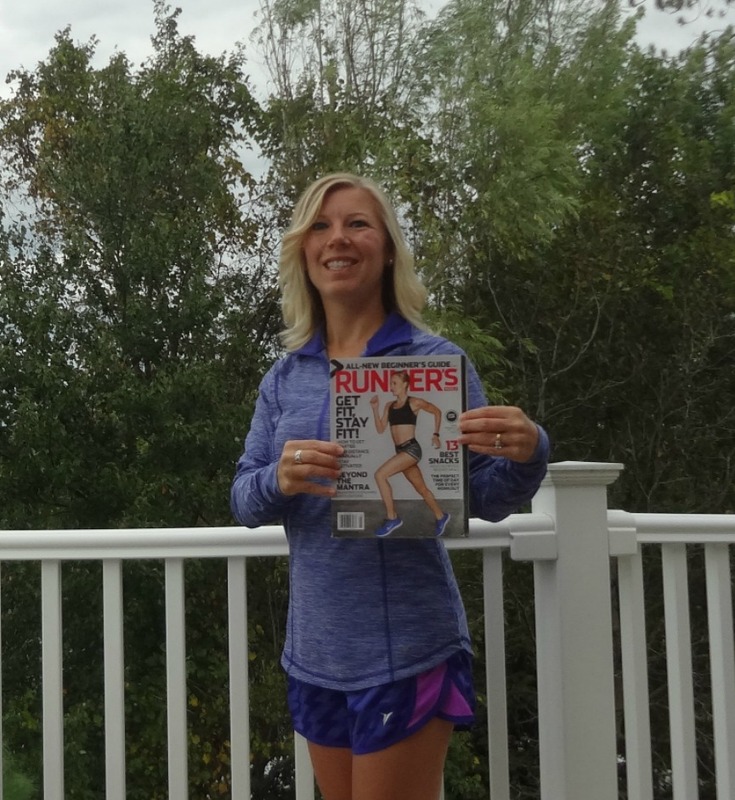 Did you learn anything interesting about Runner's World so far? We had a very exhausting weekend so I am afraid our Runner's World visit post will have to wait until tomorrow when I can spend more time on it. For today I will just do a brief recap of the Harvest Festival Race I ran on Saturday with my Dad. 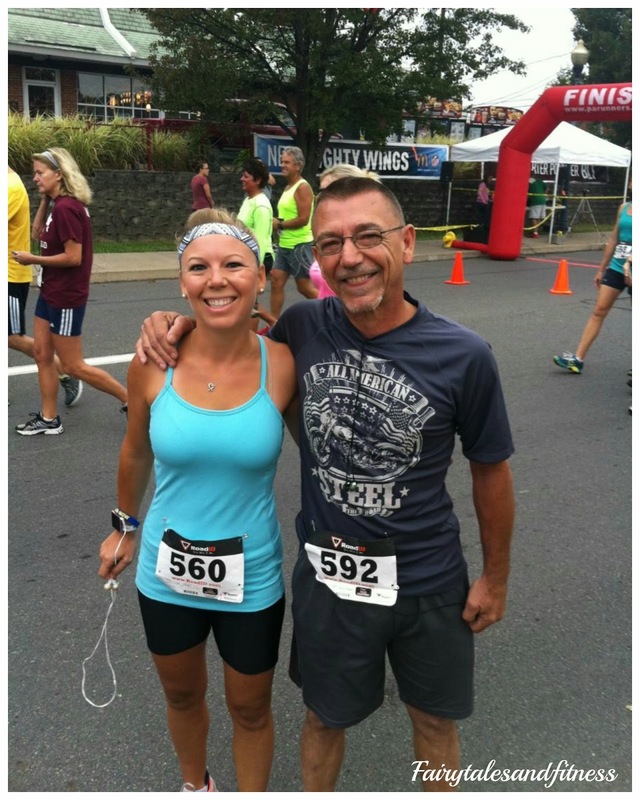 I've run several Disney races with my dad, the Hollywood Movie Madness Race ( which he placed in his age division), and most recently the Run for the Dream race in Williamsburg, VA. My dad is a great race buddy! This is a local 5K race and it is a very flat and very fast course! This race is very popular among the local track and field team ( so there were lots of students running this race). Lacey won first place in her age division in this particular race last year! This wasn't on my list of races to do until the last minute, so up until last week I haven't been doing many 5K training runs. I have to admit I have a different method of running when I'm training for a 5K versus a 10K or longer. I already had my Garmin watch set at 3 min-30 sec. intervals. I will run my normal pace for 3 minutes and then for 30 seconds I will really push and run a little harder. This method has worked well for me in my last few training runs and I have been able to keep my 5K time under 30 minutes which was my goal. Me and my dad before the race. For the first full mile I was running neck to neck with another girl who was running my pace. I asked her what her goal time was and she said 25 minutes. Although I knew I wanted to finish in less than 30 min, I was certain I wasn't going to be able to keep this pace in order to finish in 25. So by mile 2, I slowed it down a bit. I don't think I followed my 3 min-30 sec intervals the whole time. I ran slower when I had to and pushed harder when I felt I could. 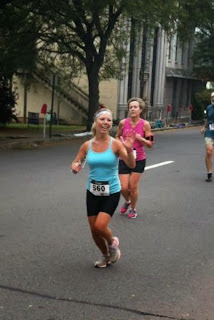 As I was nearing the finish line, I saw one of my friends who knew that my goal was to finish in less than 30. She was cheering for me and letting me know that I was going to do it! I saw the clock ahead and started pushing harder. When I crossed the finish the clock read 27:56, although for some reason the official print out said my time was 28 min. Either way, I was very happy with my time. A new PR for me! So neither of us won any age division award, but I did walk away a winner. Not only did I PR, but I won my choice of Road ID. I've been reading a lot of posts lately about the Road ID bracelets, so I was excited about my prize. If you are considering a Road ID of your own, I can offer you a code for Free Shipping! I didn't realize there were so many styles of road ID and even ones that you can wear on your shoe! Do you have some sort of Road ID that you run with it? We had a wonderful time at Runner's World yesterday. We met some really great people and learned a lot! I can't wait to tell you all more about it in a future post. For now I will give you a sneak peek of this? Can you guess who's office this is? (I guess if you looked hard enough you could figure it out) A great way to display all those bibs don't ya think? 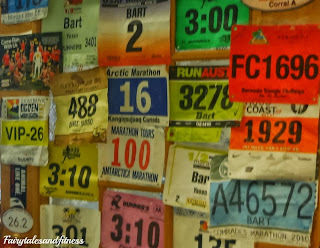 Can you spot the bib from the Antarctica Marathon? I don't know if that race will ever be on our list of races to run! So today Meranda will be running a local 5K race with her dad and Lacey will be taking a rest day! It's calling for rain today but I hope it waits until after the race! 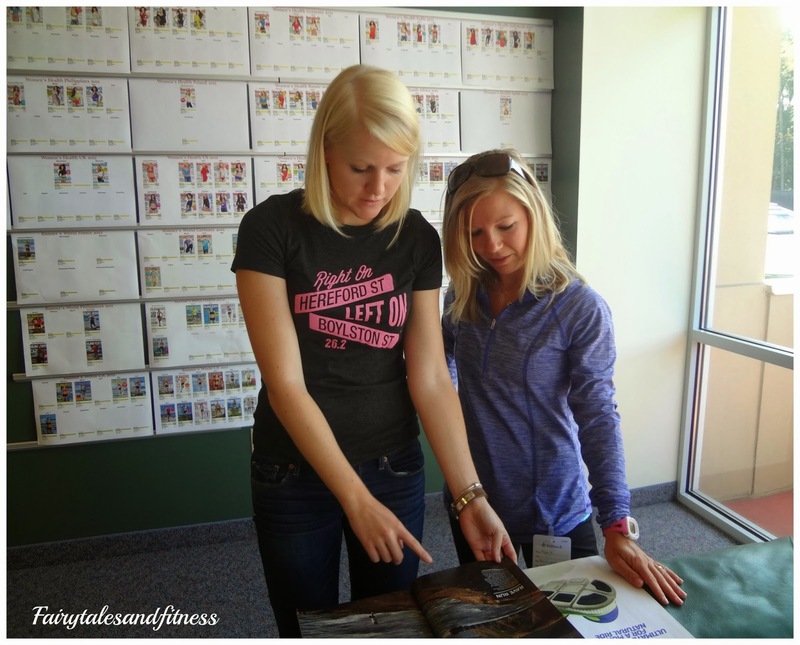 Earlier this month we were invited to visit to the Runner's World headquarters and today is the day we will be going! 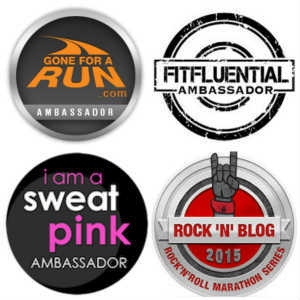 I will be running in the Runner's World Festival in October, so this will give me a chance to check out the area. I'm anxious to check out this course because I heard there are several hills. There is also a dog run on Saturday afternoon so I may have to check out some pet friendly hotels while I am there! In other Runner's World news, have you seen the advertisement for the new Runner's World cookbook? We have it here! It was sent to us last week to review. Hopefully this weekend we'll get to cook up some of the yummy recipes and share them with you before the books arrive in stores in October! Today is also Run at Work day. Will you be running at work today? Have a great weekend everyone! I will be sure to report back on Monday. If you could ask a Runner's World editor any question, what would it be? ﻿﻿﻿﻿﻿﻿﻿﻿﻿﻿﻿﻿﻿﻿In order to avoid the mayhem we encounter during the Disney Marathon weekend over the whole race shirt situation, we decided to do our research a bit earlier this year. For those of you who do not know, there was such a debacle over the shirts for the marathon ( especially the ladies, and the ones who needed a smaller size). It was just overlooked by hundreds of runners that the sizing for the long sleeved marathon shirts were men’s ( or unisex) sizing. Therefore women who normally wear a size medium race shirt signed up for a medium and quickly realized they were swimming in it and needed to exchange it for an extra small shirt. We have since learned that the only Disney races that offer woman's sizing are the Princess Races ( and Tink). Disney does allow you to switch shirt sizes but we were told we had to wait till the last day at the very last hour of the expo ( This was our experience during the Marathon weekend, although some others have said they didn't have to wait till the last day, but just know that Disney COULD make you wait till the last day of the expo to ensure that they have enough shirts for those who still need to pick up their race packet.) The last day of the expo we stood in line for over two hours so we could have a chance at exchanging a shirt. Luckily, we did get one. What is the point of having a shirt to commemorate your very first marathon if you can’t even wear it? This was just a little back story, now on to the real topic at hand......The princess half marathon shirts! From shoulder seam to waist band ( vertically) it is 23 inches long. Waistband of shirt is 17 inches across. 2. 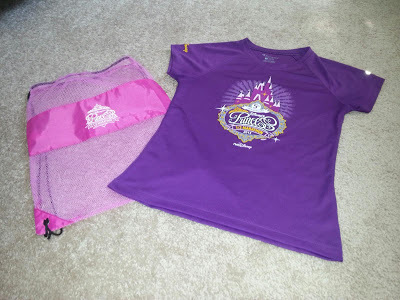 Run Disney has confirmed that the style of the 2014 Princess half shirt will not be the same as the 2013 shirt (I don’t mean design either, I mean cut and size wise). 3. Run Disney has put up a sizing chart to help you decide which size might be the best fit for you. (My advice is to start measuring some of your other race shirts ( make sure they are tech shirts) and compare the dimensions. Princess Half Marathon Sizing Chart . 4. I know for a fact that on my order form that I chose a size x-small for the Half marathon and small for the 10K, yet RunDisney had my order down as both shirts being an x-small. So whatever you ordered for your half is what you will end up with for the 10K too. (which is generally not a problem for most people, but I was just worried about sizing and figured that if I ordered one of each, I at least would have one shirt that fit properly)! I asked if I could have one of each and the lady at Run Disney said they would be the same size for both races. 5. If after seeing the size chart you feel you need to change sizes, RunDisney said the approximate cut off for the shirt ordering would be October 7th. But I would get your ordered changed ASAP so there isn’t any problem. Hopefully this has helped clear up some confusion on shirt sizing for the prince half weekend. It's always hard to tell what the sizing of race shirts are going to be like, especially when they change from year to year. Unfortunately we are always in that "in between" size and don't want to "guess" wrong, especially when it comes to a cool Disney race shirt. Was this post helpful to you? Have you always been spot on when picking your race shirt size? Are we the only ones that stress over this kind of stuff? Please share your own race shirt stories if you have one! Thanks to those of you who played our guessing game yesterday. You guys are very good guessers! We certainly were in Canada! What gave it away? We had the perfect weather for a pre-fall get away! 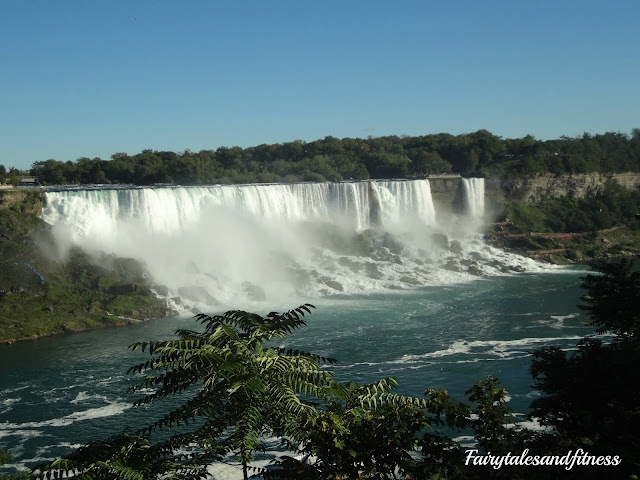 We have each been to see the falls before ( separately), so this was the first time we have been here together and really got to experience the touristy side of Niagara Falls. We stayed on the Canadian side. 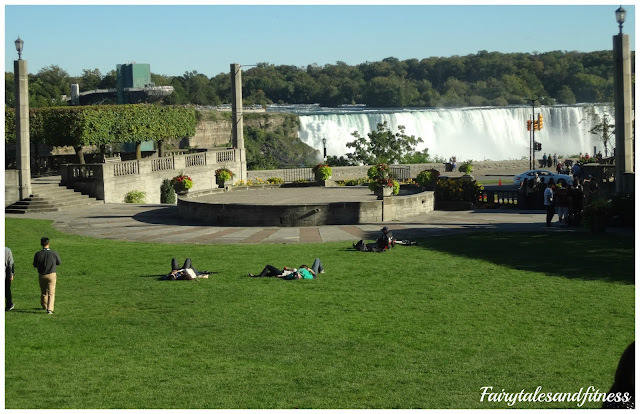 If you want to stay right in the middle of all the Niagara Falls tourist attractions, this is definitely the side to stay on. I really don't think there was much to do over on the American side. Because of all the bright lights and attractions, Niagara Falls reminds me of a mini Las Vegas. 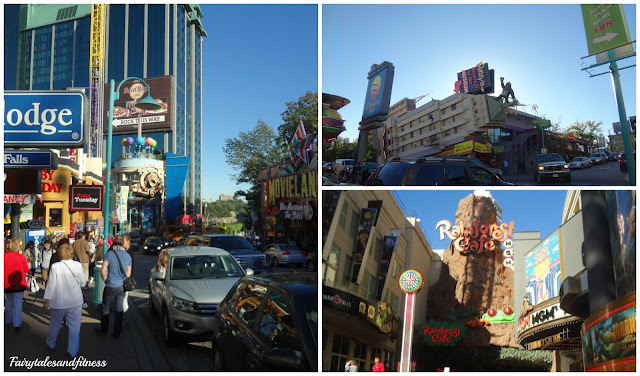 Having been to Las Vegas before, I think I would actually prefer Niagara Falls because it seems more family friendly. Here are just a sampling of things to experience if you come to Niagara Falls on the Canadian side. 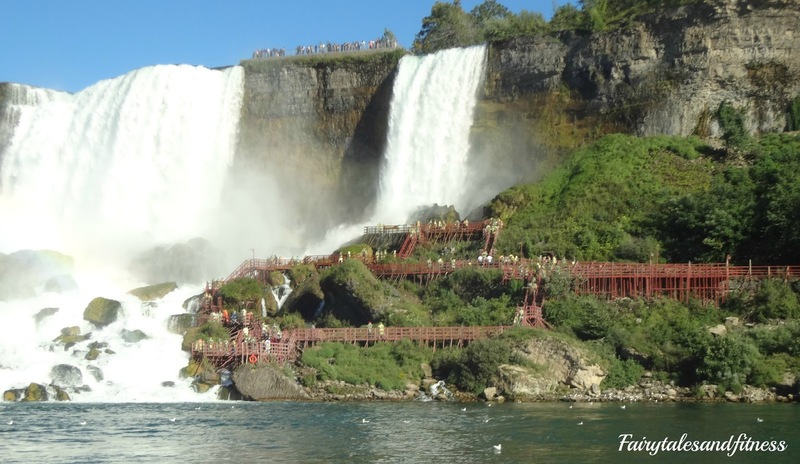 Of course the main attraction is the falls itself. 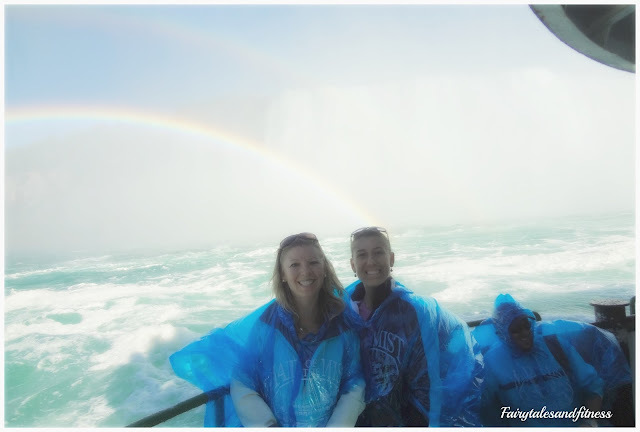 If you want an up close and personal view of the falls, there are many tours you can choose from. We chose to do the ever so popular Maid of the Mist. This is a boat that travels past both sets of falls. Yes, you will feel all the mist coming from them. That's why you get this fancy ponchos before you board! Because of all the mist in the air, you can't really expect your pictures to come out very clear. Can you make out the rainbow right behind us? We thought that was pretty cool. That was the closest we've ever been to a rainbow! Another activity you can do is take a walking tour BEHIND the falls. 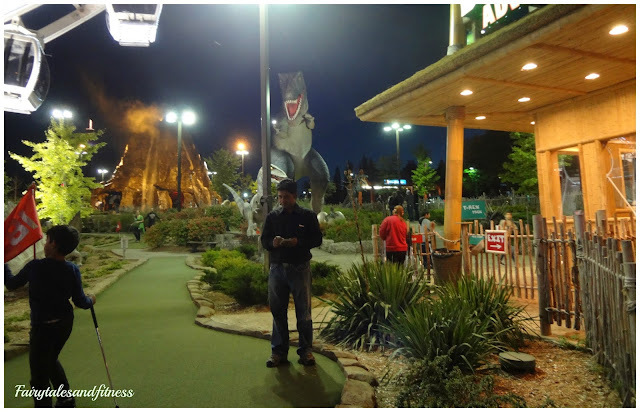 Make sure to go back and visit the falls at night too as they light up in different colors. 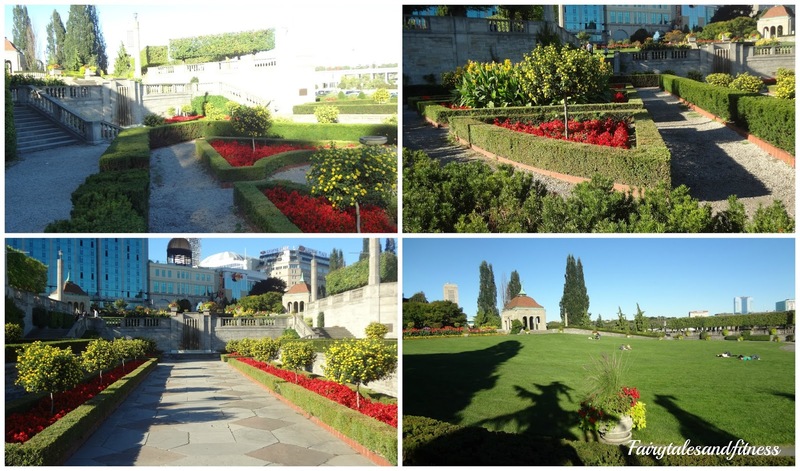 Another thing you want to make sure you stop to see are the lovely parks and gardens in Niagara Falls. I think the people relaxing in this park have the best view! What do you think? 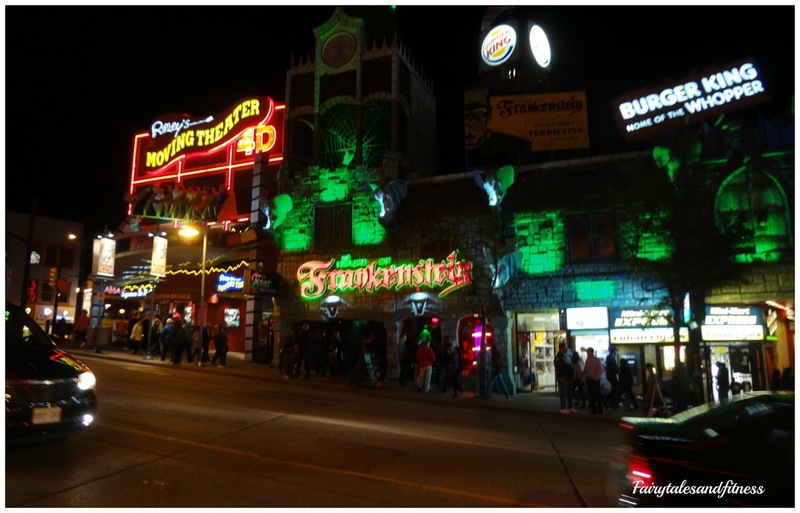 Clifton Hill is the "main drag" in Niagara Falls. Here you will find shops, restaurants, hotels, fun museums ( like the horror museum, Ripley's Believe it or Not, and Guinness Book of World Records just to name a few), mini golf , laser tag, and much more interactive entertainment. We even found a Rain Forest Café! The city of course lights up at night! 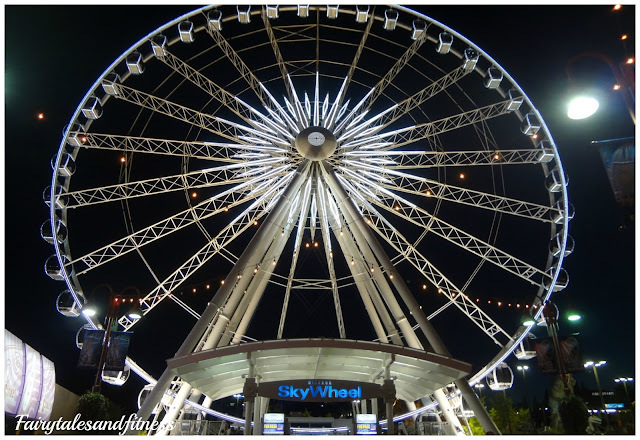 If you want a view of the city from above, you can take a ride on the Sky Wheel. This is a dinosaur themed mini golf with an "active" volcano! On Sunday morning we made an effort to get up early and go for a run before all the hustle and bustle started. It was so nice running the streets of Niagara Falls with out a soul in sight! probably a view few ever get to see! We ran by the falls again and of course had to get a picture by the water. Thanks for reading about our little adventure! In our last post we told you that we would be going on a little adventure! We'd like to have a little fun and see if you can take a guess at where we are. If you already know where this is, then you are really good with your destinations! If you don't know, that's okay, we will post more later. We've had beautiful weather and lots of fun exploring! We have lots to report on this week and will get back to our regular blogging soon! So take your best guess. Where do you think we are?